What do I want others to understand through my community project? 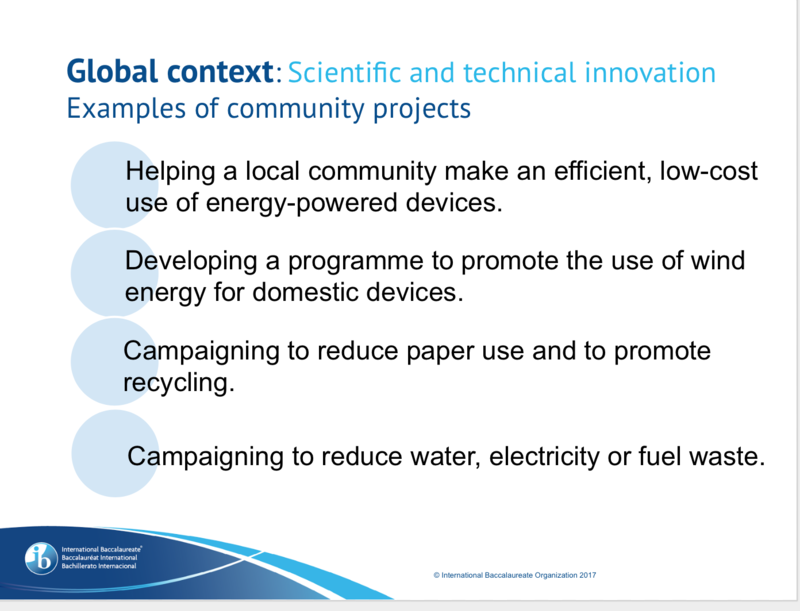 What impact do I want my community project to have? 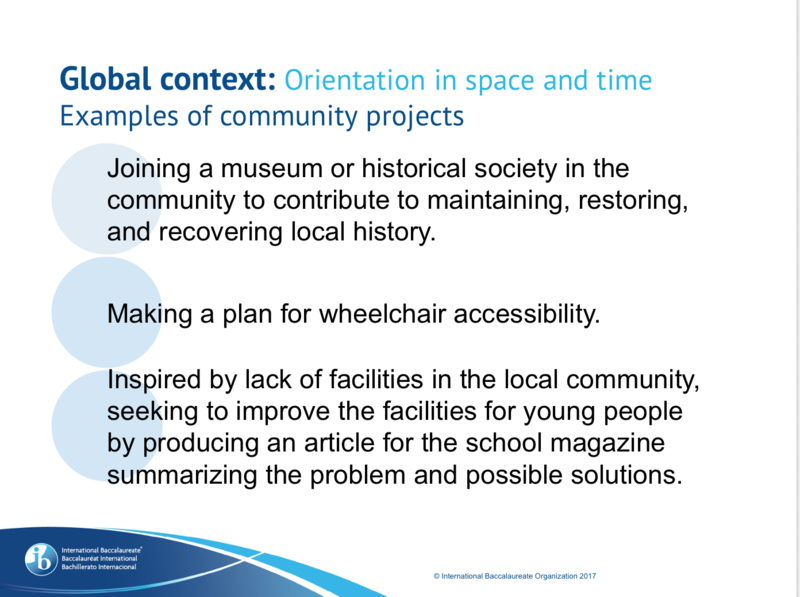 How can a specific global context give greater purpose to my community project? Choose ONE Strand in ONE Global Context! This global context helps you look at what makes you different from others and what you share with others. This is a starting point for understanding other people in your community and beyond. This global context is not just about studying the time and place of an event. It also means looking at how the event has made an impact on personal as well as global history. For this global context, you will explore the question: How can understanding the "when" and "where" of events help you to understand the world in which you live today? 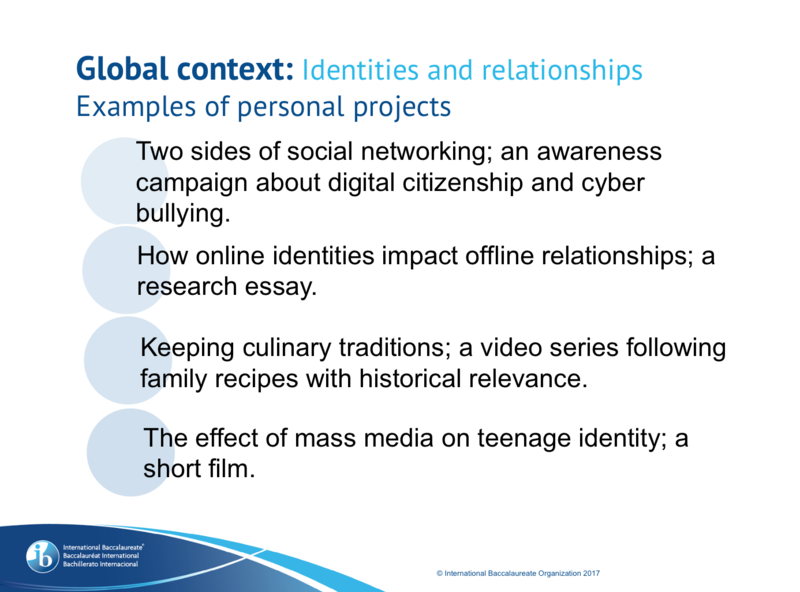 The relationships between and the interconnectedness of individuals and civilizations from personal, local and global perspectives. 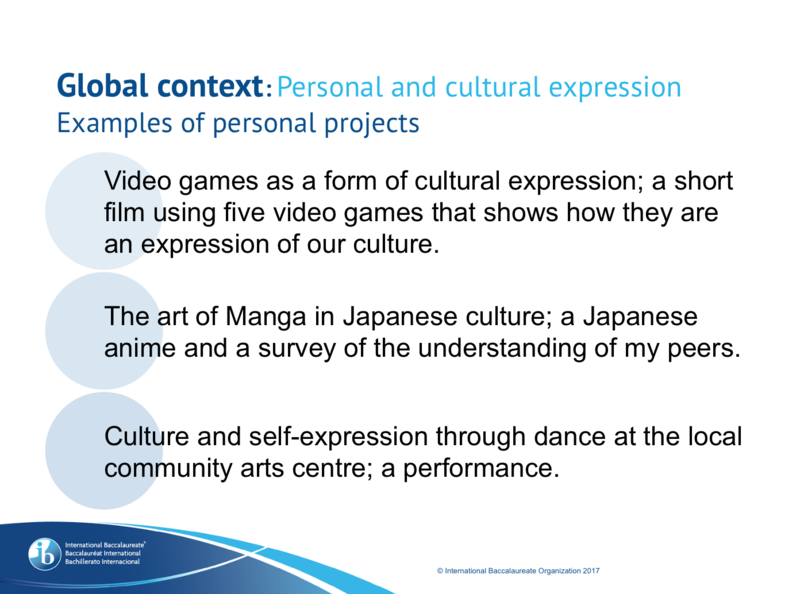 This global context is about creativity and forms of expression. It is also about seeing things from different points of view. For this global context, you will explore the questions: What does it mean to be creative? What are some ways you can express yourself, your culture, your ideas and beliefs? Our appreciation of the aesthetic. This global context is important because science and innovation help you adapt to the world. Scientific inquiry into the natural world helps you understand your world and the impact you have on it. For this global context, you will explore the questions: What impact does the natural world have on you? What impact do you have on the natural world? This global context is about how concerned we are worldwide, how we make decisions about global issues and how we can act in a responsible way to make the world a better place. 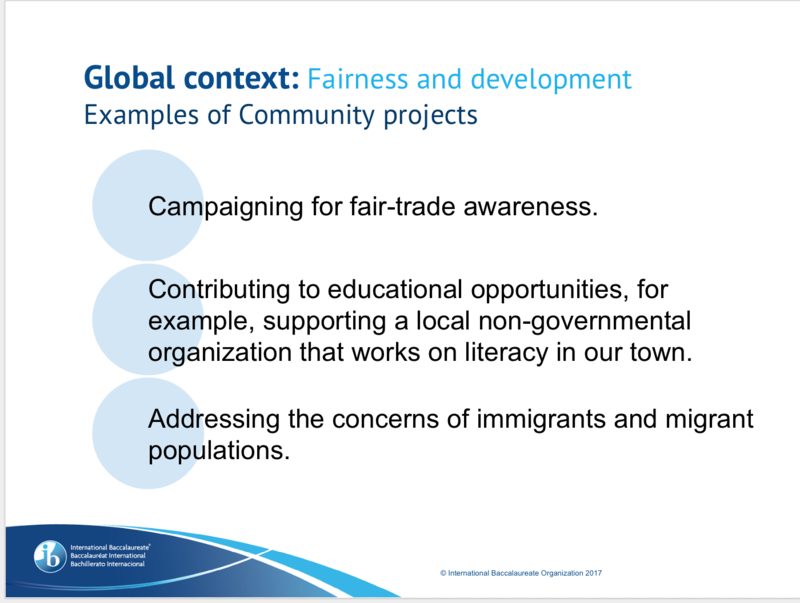 For this global context, you will explore the questions: How are people connected and how does this impact me? How can our way of life and the systems we have in place last long term? The impact of decision- making on humankind and the environment. This global context addresses the nature of conflict and peace and how they both relate to the issues of fairness and sustainability. Get some ideas! 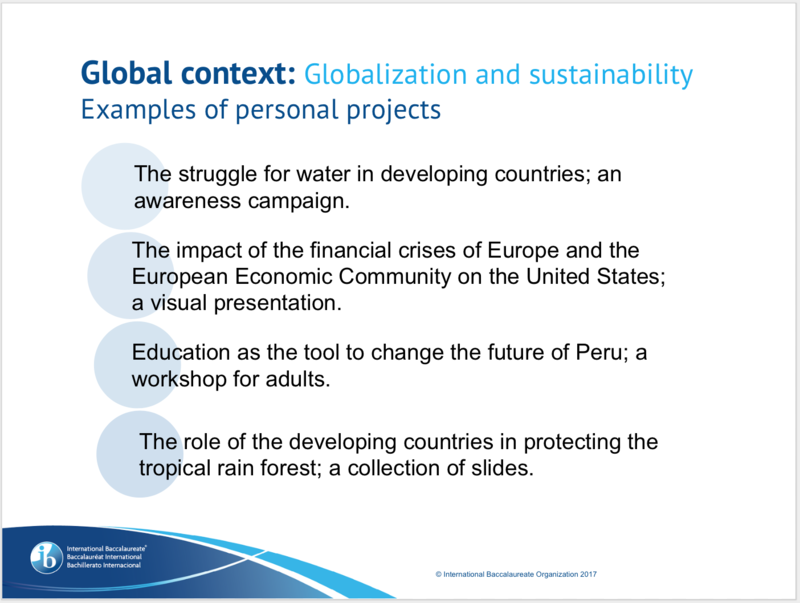 One school's sample Personal Projects (past 7 years) by Global Context. Many have YouTube to explore.